Despite "intensive beta-testing," the American governing body makes very light updates to its latest edition of roller derby rules. USA Roller Sports has released the 2015 version of its roller derby rule set, to go in effect immediately for sanctioned USARS play. It is the fifth edition of the rules published by the USARS derby committee. After a year of gameplay and some months of beta testing, USARS concluded that only minimal changes were needed to refresh its derby rules for the new-year update. The majority of changes were simple language clarifications, with most other additions being additional verbiage to end minor misinterpretations. Of the three notable changes to the 2015 rules, two directly affect players, with only one of them causes direct impact on actual gameplay. That one allows players stranded out of play ahead of the pack to come to a complete stop and wait—which is otherwise illegal during USARS gameplay—to allow the pack to skate forward and catch them back up, allowing them to get back into a play more quickly. The very low number of changes to the 2015 document is somewhat surprising. This past November, USARS asked some of its member club teams to engage in some beta-testing (PDF) to address the still-apparent problem of runaway packs, which last year caused a few jams to be all roller and no derby. At least for now, USARS players and teams did not see a need to implement the recommended solutions, which may be because the rule changes implemented last year proved effective. 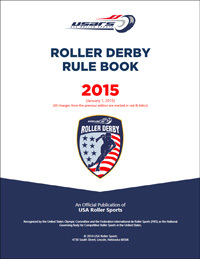 The 2015 USA Roller Sports Roller Derby Rule Book is available for download on the USA Roller Sports rules section of the U.S. Olympic Committee Team USA website. The WFTDA announced a similar phasing-in, giving teams until 2016 to implement larger numbers and start discouraging the use of letters on jersey/roster numbers. WFTDA skaters will still be able to use up to four numbers, however. The third is so minor it’s getting relegated to a footnote: It has now been put to writing that track boundary lines can be up to an inch in height. Yawn.